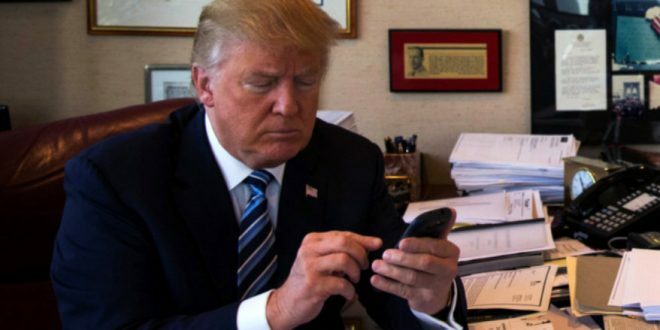 Lawsuit Seeks To Stop Trump From Texting Nation - Joe.My.God. Three New Yorkers are suing in federal court to try to halt a test scheduled for Wednesday of a system that allows President Donald Trump or any future president to send alert messages to the cellphones of all Americans. The activists filed the suit last week in U.S. District Court in Manhattan, arguing that the system violates their free speech rights and constitutes an unconstitutional seizure of their electronic devices. The first-ever national test of the “presidential alert” system for mobile phones and similar devices was originally planned for Sept. 20, but it was delayed due to the onslaught from Hurricane Florence. Under FEMA rules there is no opt-out for presidential texts.